Target Liberty: Is the Alleged Russian Agent Maria Butina About to Flip on the National Rifle Association? 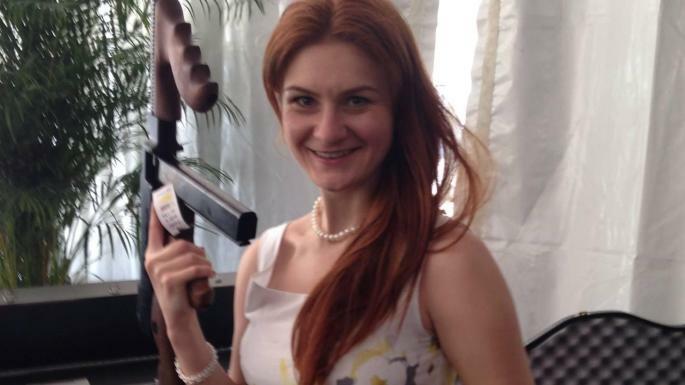 Is the Alleged Russian Agent Maria Butina About to Flip on the National Rifle Association? Things continue to get more bizarre as we travel down the Deep State rabbit hole. Indications are that alleged Russian agent Maria Butina, who was arrested by the FBI in July 2018, is about to flip. It should be noted that she is the founder of Russia-based "Right to Bear Arms. " So what does this have to do with the National Rifle Association? Butina, alongside Aleksandr Torshin, a former member of the Federation Council, a member of Vladimir Putin’s United Russia party, and a deputy governor of the Central Bank of Russia, established a cooperative relationship between the National Rifle Association and Right to Bear Arms. Following the 2011 meeting, then NRA President David Keene expressed his support for Torshin's "endeavors" and extended an invitation to the 2012 meeting. Torshin also attended NRA annual meetings in 2012 and 2013. In November 2013, Keene was a guest at the conference of the Right to Bear Arms in Moscow. Butina and Torshin attended the 2014 NRA annual meeting as special guests of former NRA president Keene. Butina attended the Women's Leadership Luncheon at the 2014 meeting as a guest of former NRA president Sandy Froman. Butina presented to then NRA president Jim Porter a plaque from Right to Bear Arms. Afterwards, she tweeted "Mission accomplished." As Keene's guest, Butina rang the NRA's Liberty Bell, saying, "To the right to bear arms for citizens of the whole world." Butina and Torshin also attended the 2015 NRA annual convention. In 2015, a number of NRA officials attended Right to Bear Arms's annual gun conference in Russia. Among them were Keene, gun manufacturer and NRA first vice president Pete Brownell,conservative American political operative Paul Erickson, and Milwaukee County sheriff David Clarke. One of their hosts was Russian Deputy Prime Minister Dmitry Rogozin, who in 2014 was sanctioned by the White House following Russia's invasion of Ukraine. Clarke's trip cost $40,000, with all expenses paid by the NRA, Pete Brownell (an NRA board member and CEO of a gun-parts supply company) and Right to Bear Arms. According to a disclosure Clarke filed, Right to Bear Arms paid $6,000 to cover his meals, lodging, transportation and other expenses. During the meeting, Clarke met the Russian foreign minister and attended a conference at which Torshin spoke. In November 2016, Torshin tweeted that he and Butina were lifetime NRA members. With that as background here is Zoe Tillman, a BuzzFeed reporter, filling us in on what is going on in court today. Judge in Maria Butina's case schedules a telephone conference for 11a tomorrow, with 14-hour notice. No other information is given in the docket entry. The next scheduled conference in the case was not until Dec. 19. Judge is holding a last-minute conference in alleged Russian agent Maria Butina's case. A brief portion was on the record, Butina's lawyer said they're okay cancelling a status conference set for 12/19, anticipate not needing to pursue a subpoena, then asked to seal the hearing. Recall that on Nov. 28, the lawyers said they were still in the process of negotiating a deal for Butina. And we're told the judge has left the bench, so it appears she'll let the latter part of the hearing in Butina's case today remain sealed and we're not going to learn anything else right now. NEW: The court has appointed federal public defender AJ Kramer as "advisory counsel" to alleged Russian agent Maria Butina — no other information provided. The judge has now given Maria Butina until Dec. 10 at 5pm to explain why the transcript of the sealed part of today's hearing shouldn't be made public. This sure appears like co-operation related activities, The question then becomes what could she possibly be co-operating about? The relationship between Butina and the NRA becomes mighty interesting under these conditions. There are other possible points of co-operation. Butina attended FreedomFest, where Trump gave a speech, and asked him from the audience about ending U.S. sanctions against Russia, to which he replied, "I don't think you'd need the sanctions." Butina hosted a birthday party attended by her boyfriend, the Republican political operative Paul Erickson, and Trump campaign aides shortly after the 2016 election. In May 2016, Erickson sent an email with the subject line "Kremlin Connection" to Trump campaign adviser Rick Dearborn, asking Dearborn and then-Senator Jeff Sessions for advice on setting up a meeting between Trump and Putin at an annual NRA convention. Or maybe she is going to flip against Russia. Or maybe she's the one who already flipped on Russia. I still don't believe that the CIA could know Russian Hackers were responsible for the Hillary-gate or other hacker activities without an "asset" in place. And who cares. There is so, so much suspected wrong doing by so many politicians that isn't being explored and most likely never will be at this rate. The Clintons and friends have so much unimaginable wrong doing that it seems comical to be concerned over these allegations of Trump wrong doing. I am not standing up for Trump but simply trying to realign perspectives. Trump is nothing compared to the real evil. The main stream media still has control of the narrative. So whats is illegal about this? and anyway it show the effort the Russian govt is giving it if they are going to the NRA to get a more favorable position.